Dawn T here today to share my love of Altenew. I'm so happy that we secured them as our sponsor this month... quite a coup! 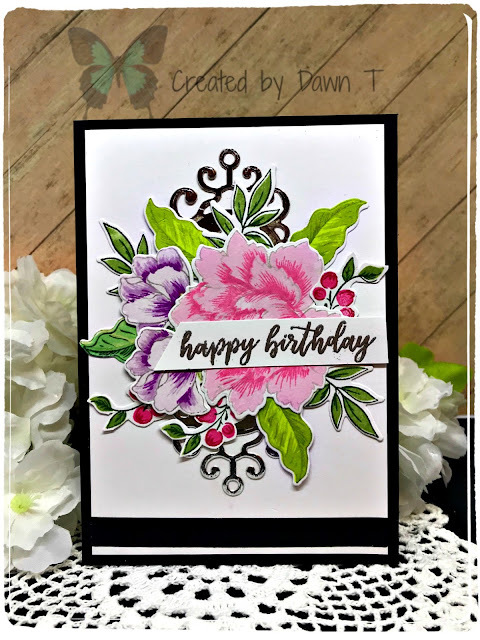 Altenew’s Mini Blossom Die Cutting Machine is the compact and portable must-have tool for your craft room! It is designed to work with Altenew dies (sold separately) and other wafer-thin metal dies. It can be used to quickly and easily die cut a variety of materials, including cardstock and Altenew specialty papers, and will help you add texture and dimension to your projects. The elegant and clean design will look wonderful on your craft desk, secured on its stable base with suction feet. Check here to order Altenew's Mini Blossom Die Cutting Machine. I was inspired by a card I saw on Pinterest by Yana Smakula. Yana is a designer for the Altenew team and is extremely talented. I used her design with some changes I used different colours. My big flower is from Peony Bouquet set and the smaller ones are from Beautiful Day set. Altenew have dies that match many of their sets and both the sets I used have them. I used the dies to cut all the flowers and leaves apart of the berries (I lost the die to match them so had to fussy cut) I used a Spellbinders die(Ironworks) to cut my medallion behind my bouquet out of silver mirror card. The sentiment is from a newer Altenew set called Sincere Greetings and has been embossed with some silver powder. Loving all your lovely projects. Thanks for joining us this month.